Multiple Scan Modes to Easily Recover Data from highly Corrupt VHDX/VHD file. Potential to Recover both Dynamic & Static VHD File with high proficiency. No File Size Limitation to Scan & Recover VHDX and VHD file of any size. There is no need of virtual environment to repair corrupt vhdx or vhd file. Free Demo Version only allows to view the recovered data. 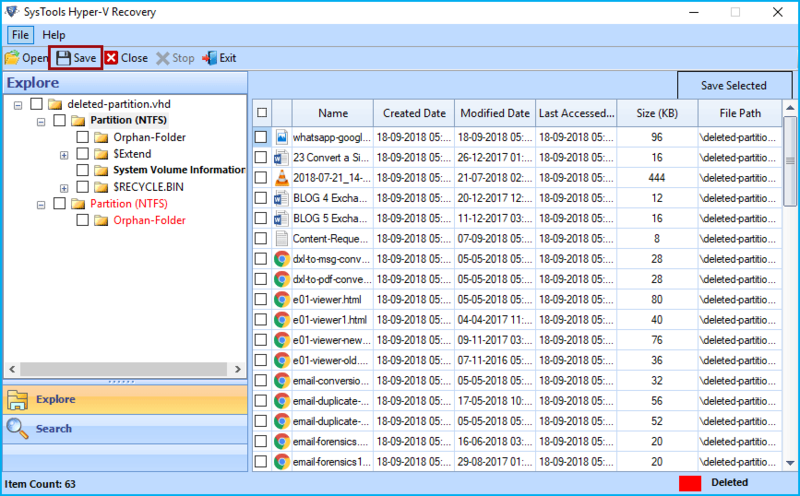 The VHDX Recovery Tool supports the complete recovery of vhdx/vhd file data such as videos, audio, images, archive, database etc. The VHD repair tool follows the advanced reverse engineering algorithms to recover and restore data items from empty recycle bin, folder and partition stored in VHDX or VHD files. 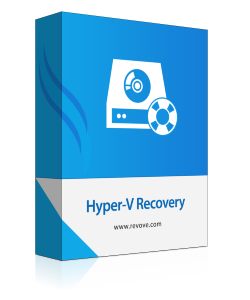 The Hyper VHDX Data Recovery Tool allows the instant preview of data after the completion of the recovery process. 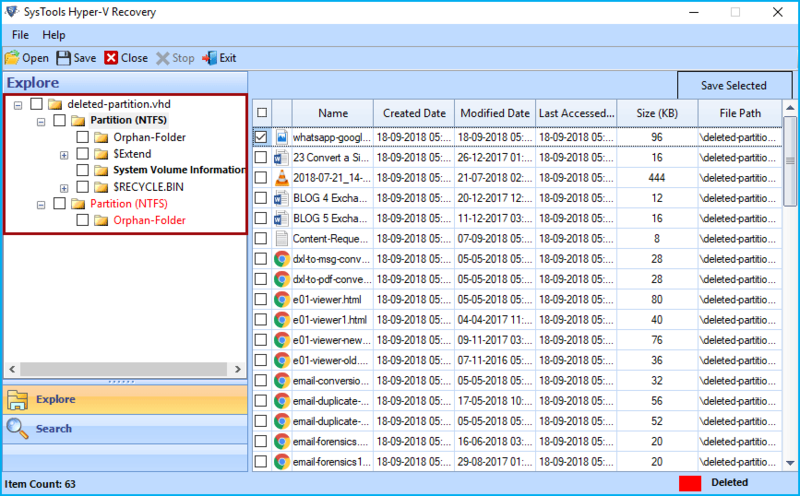 You can easily view emails, documents, images and other items stored in the vhdx file partition. The software only allows viewing some selected file like documents, PDF, Emails, text files & other similar data. The VHDX Repair Tool provides the multiple scan modes to repair and recover corrupt vhdx file. The quick mode will help in case of minor corruption issues while advance scan can be effective in major corruption in vhdx file. Raw Scan Modes will be the key to fix the issues of Mater Boot Record (MBR) file. 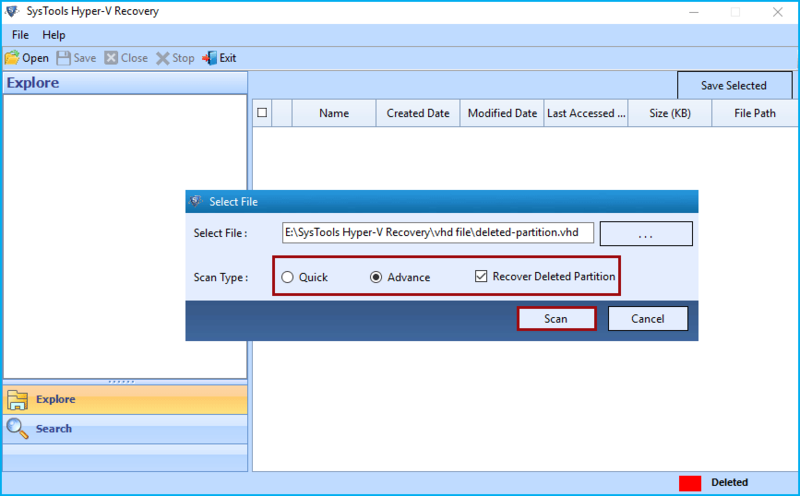 The Hyper-V VHDX Recovery tool supports the quick recovery of data from the dynamic as well static vhd file partition. The software is capable enough to recover data from uncountable VHDX files taken one file at a time. The healthy VHDX files can also be recovered from the uninstalled virtual environment with help of best vhd repair software. Microsoft Hyper-V VHD Recovery Software allows to safely recover data from the FAT(16, 32) and NTFS (4, 5, 8). Dynamic VHD file is supported in case of NTFS & FAT 32 and for the Fixed VHD file, it supports all file systems. The Software also provides the extensible support to the FAT16 file system of fixed VHD file. The Windows Hyper-V Data Recovery Tool provides the flexibility to save recovered data at the location specified by the user. The VHDX repair tool precisely repairs corrupt data and allows to save the complete data with default meta property and folder hierarchy. It also allows you to save the selected files/folders using the Check/Uncheck facility available there. Hyper-V Disaster Recovery Solution easily recovers data from the Virtual hard disk created during the virtualization of System performed at Windows Operating system. It is enriched with high-quality recovery algorithms to successfully recover data from corrupt vhd files of virtual systems. The Window Hyper-V Recovery Solution provides the highly proficient search option. By search option, you can easily perform the search queries on data present inside the vhdx file. You have to only enter the extension of the file and software automatically lists complete data in quick seconds. Support: Windows 10 & All below Window Version. Hard Disk Space: 100 MB of free hard disk space. Microsoft Windows – 2000, 2003, 2008, 2012, XP, Vista, 7, 8, 10(32-bit & 64-bit). Does the VHDX Repair Tool support the latest Windows 10 OS? Yes, VHDX Repair tool supports the latest Windows 10 OS and other below versions also. Is there any option to save the recovered data? Yes, You can save the recovered data from damaged vhdx and the vhd file. Can I recover the permanently deleted data using the hyper-v vhd recovery tool also? Yes, VHD Data Recovery Tool allows you to recover shift+delete or permanently deleted items also. I have some highly corrupted vhd files. Can I recover data from it using the VHDX recovery software? Yes, definitely vhdx recovery tool allows you to recover data from corrupt vhd files. What is the limitation of using Free Hyper-V Recovery tool? The Free Version of Hyper-V recovery tool only allows you to preview the recovered data and does not allows you to save it. Accidentally, I have deleted some crucial data from VHD file. I try all the solution to retrieve the data. But fails to do so. Then I found the best VHD recovery software on the internet while searching for the solution. It quickly recovered my crucial data from the wink. Thanks for support team for helping me to configure the software on Windows 10 professional. Hyper-V Data Recovery Solution persistently helps me to restore my media files such as video, images etc. From the corrupt or damaged virtual hard disk. The software impressed me the lot to buy go for the pro version. The functionality to save the data at desired location is the outstanding. Thanks for such nice software.